Bas-Eco is an Entomopathogenic fungus based on Beauveria broningiarti which attacks insects, Controls bollworms in Cotton, Whiteflies in Tomato, Brinjal, Cotton etc., Root grubs in Sugarcane Berry borer in Coffee etc. Unlike other bacterial and viral pathogens, Bas-Eco can control/infect larval and pupal stages of insect pests. Bas-Eco is an environmentally friendly bio agent and is used world wide to control hard to kill insects. When we apply insecticides normally few insects will escape spray and some may be tolerant. 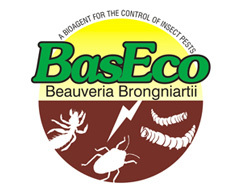 Bas-Eco will kill the escaped and tolerant insects by unique mode of action. Bas-Eco on coming in contact with the insect, the spores will germinate and penetrate through the cuticle and multiply in the haemocoel. Bas-Eco produces toxic metabolite called 'Beauvericin' which inhibits the metabolic enzymes there by causing paralysis and ultimately death of insects. The dead insect is transformed into mummy (hard and solid structure) due to saprophytic development and emission of large quantities of toxins by Bas-Eco funguses, which prevent the decay of the mummified insect. In this stage the insect is totally covered by white mycelium of Bas-Eco fungus. It takes 5-7 days for exhibiting these symptoms. High humidity helps in achieving good efficacy in insects by Bas-Eco..
Foliar Spray : Bas-Eco should be applied @ 750 gms per acre along with conventional Insecticides/Symtetic Pyrethroids or 1000 gms per acre when it is applied alone along with 20 gms of Jiggery in 200 litres of water preferably during morning or evening hours. Soil Drenching : For control of root grubs dissolve 1800 Gms of Bas-Eco in 400 litres of water and drench the soil thoroughly. Keep in a cool place, avoid direct Sunlight. Use safety gloves while handling to avoid direct contract with skin.